This guest post comes to us via Alex Frank, who shares common mistakes guitarists make when they’re first getting started on their instrument. By the way, if you have something to say, and you think you’re right for The Music Entrepreneur HQ, go read our guest post guidelines to get brought up to speed. When one sets out to learn something new, it is inevitable they will encounter some difficulties upfront. Mistakes are common. The same is true for the beginner guitarist. There are some stumbling blocks, which if not addressed, can become habits and impede the progress of the beginner, and prevent them from becoming a competent guitarist. It is therefore quite important to understand some of the potential mistakes that one is likely to make, with a view of avoiding them. 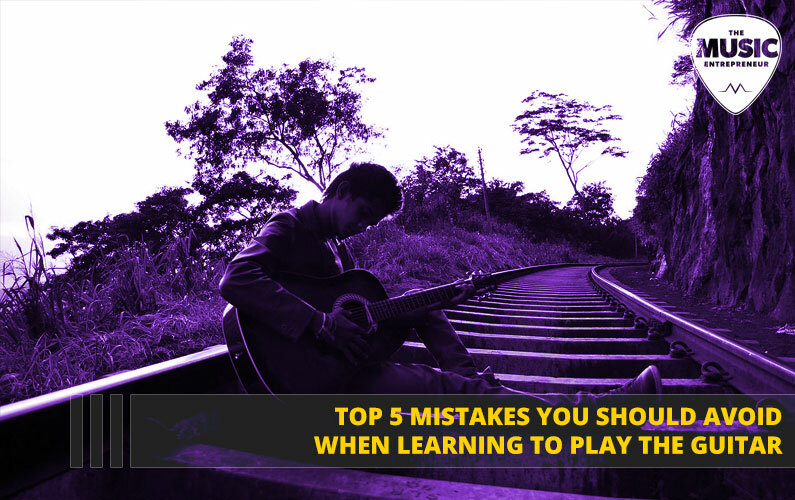 The following are five real mistakes one should avoid when learning the guitar. Many new guitarists are self-conscious and feel naturally shy playing in front of an audience. This is a major mistake as the beginner will miss out on the compliments, constructive criticisms, and comments from the audience that could guide them to the next level. Of course, you don’t need to practice in front of total strangers as they may not be too kind. You practice playing in front of family, friends and close associates first. The smiles, applause and gentle correction received from this type of audience is likely to be encouraging and will motivate the guitarist to continue practicing. You can also jam with others. This is a valuable stepping stone onto performing in a band or group situation. Beginner guitarists sometimes complain music theory lessons are too boring or difficult. Some also fear technical knowledge will cause them to play more robotically and mechanically. This cannot be further from the truth. It is true that learning music theory can be time-consuming, but it can speed up your understanding of music. Music theory lessons will help you understand the relationship between rhythm, harmony, melody and structure. Theory can help you make sense of what you’re playing, and enable you to create beautiful music. Many new guitar players make the mistake of trying to play too fast too soon. They fail to appreciate that playing slowly but correctly is more important than playing fast but poorly. You can build your speed through practice, but only gradually. You may be tempted to rush through lessons and move onto other concepts before you’ve mastered anything. It’s important to take some time to learn a song and practice it until you fully grasp it before you move on. Perfecting one technique or song is better than going an inch deep with every module. Beware of getting frustrated and developing a negative mindset. This will prevent you from getting to where you want to go in your guitar playing. Many beginners are easily overwhelmed by the amount of information available on how to play the guitar. They make the common mistake of switching from one source or teacher to another, especially when they come across a challenge they are unwilling to confront. It’s easy to find content you can sink your teeth into – online courses, internet articles, YouTube videos, guitar magazines, and so on. Relying on all these sources may lead to information overload, which will ultimately be counter-productive to the learning process. You need to identify a reputable online course or teacher and remain committed and dedicated to them. Challenges you encounter could act as stepping stones onto success if properly manage. When it comes to learning the guitar, practice makes perfect. It is the only way to advance. You can develop your muscle memory through consistent practice. You must set aside time for daily practice. 30 minutes of daily practice will help you get better results than practicing sporadically. Be on the lookout for the above mistakes. You need to be vigilant, because it’s easy to pick up bad habits. I’m Alex Frank. I’ve been a part of the sound technology industry for 10 years. Today, I’m an affiliate blogger educating others on sound technology. Visit https://www.musicinstrumentscenter.com/ to learn more.